As the Capital of Italy and the Italian Lazio region, Rome is a city known across the world as a leading centre for art, culture and fashion. It is the perfect destination for both week-long city breaks and longer stays of several months, where you will never tire of things to see and do. It is a city that undeniably ‘Italian,’ and consequently the ideal location in which to learn the language. Where else in Italy can you discover some of the most famous and iconic attractions in Europe, including the Colosseum, Vatican City, the Trevi Fountain and Spanish Steps? Our Italian language school in Rome is located in the centre of the city, near the Piazza della Republica. The school is exceptionally well equipped, occupying all 3 floors of a beautifully restored detached residence, with gardens at the front, sun terraces at the back and a student cafeteria, serving snacks, drinks and typical Italian lunches every day. There are also 16 classrooms, each equipped with interactive whiteboards and a language laboratory and multi-media centre on the upper floors. Wi-Fi Internet access is available throughout the school building, but there are also Internet booths available for student's use. The school has some of the best accreditations in Italy, being authorised by the Italian Ministry of Education, members of IALC and EAQUALS, as well as being an examination centre for the prestigious CELI and CILS examinations! As a first-rate Italian language school, our school in Rome runs a wide range of Italian language courses to suit everyone’s preferences. Lessons are taught using a communicative approach, with authentic materials which will enable you to develop your language skills and learn about Italian culture and society. You can learn Italian on a Semi-Intensive Italian course with just 15 lessons a week or take an Intensive or Super Intensive course, consisting of 20 or 30 lessons per week, to learn at an even faster rate! We also offer an Intensive + mini-group course, where you will join the intensive group for 20 lessons per week and spend an additional 5 lessons learning in groups of a reduced size (2-5 students). If you prefer individual tuition, why not take a course of Private Lessons? Private lessons are extremely beneficial as not only do they allow your teacher to get to know you and your preferred learning style, but they also give you the opportunity to focus on your weaker areas, or any specific skills that you like! You can even choose an Intensive + Private Lessons course to combine group lessons with individual tuition. Our school in Rome also runs Italian Club 50+ courses, suitable for students in their fifties and above who prefer to learn Italian with like-minded students of a similar age. We also offer a Club 30 course, which is available to students aged 30-40. Both of these courses combine intensive Italian learning with a programme of cultural activities and excursions! If you need to use your Italian skills within a business context, our Business Course might just be the perfect option for you. It includes 15 weekly lessons focused around indispensable business skills, such as telephone conversations, company presentations, negotiations and sales. If you are a fan of Italian food, why not try our school’s Intensive + Cookery course? This course gives students the opportunity to prepare traditional dishes in the home of an Italian family, followed by dinner and a glass of Italian wine! Our school advises students who want to learn Italian as quickly as possible to stay with an Italian host family, giving you plenty of opportunities to practise the language skills you learn in class. Host family accommodation is available on a bed and breakfast or half board basis, or you can choose the ‘room only’ option for a little more independence. Accommodation is also available in self-catering shared apartments, shared with between 2-6 students from our school. 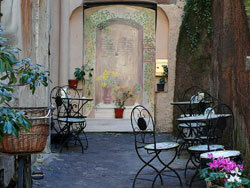 Wi-Fi access is provided free of charge in all accommodation options offered by the school in Rome. Immerse yourself in Italian culture and really get to know the ‘Eternal City’ of Rome by taking part in our school’s activities programme. Our school in Rome tends to offer an activity every day, ranging from Italian film screenings to guided tours of the city and even seminars on Italian culture and history! Many activities are included in the cost of your course fees, but a small charge may be applied to cover the cost of entrance fees or transportation. All activities are, of course, optional, but this is certainly a great way to meet other students and make new friends who share your interests! Fly to Rome Fiumicino or Rome Ciampino Airport. If you are booking accommodation through the school, we can arrange for you to be met on arrival and taken to your accommodation at an additional cost. Average score for our school in Rome based on 115 previous client reviews. Great teachers. Great introduction talk. Great activities after school. Great atmosphere. Thanks you! The course was very practical, in the sense that it employed a total immersion method of teaching giving students the optimum opportunity to hear Italian being spoken and to practice conversing in Italian. The accomodation was good: It was near the school: and it was the type of accomodation that I requested, nothing more nothing less. Just that i'm vey impressed by the way students needs were catered for and the general administrational efficiency of your organisation. The course was great, I really loved the methodology used by the teacher, there were plenty of fun activities and a lot of opportunity to speak Italian. All the materials used were up- to- date and interesting. I also liked the activities run by the school, good for meeting other students. Very friendly family, would stay with them again. The methods were very interesting and addressed the areas of my weakness, hopefully with success. They ensured I was put in the correct level after the first day was too easy. They were really nice people, I wish I could have stayed longer but I still learnt alot in 4 days! Course was excellent. I was quickly assessed and put in at a level that was just right. Classes were small and friendly. The teachers only spoke Italian and were very keen to help us get the most from our week. The course material was well thought out and ensured that every pupil was involved and conversed in Italian. Accommodation was fine. The host couple were lovely and spoke Italian to us every evening. An excellent school, I wish I could have stayed longer. I never had language courses like this before: it was great !!!! If I have known that the courses would be so nice, I shoud take 2 weeks instead of one ! :o) Congratulations for your method of learning and the very good teachers. The Italian lessons were challenging and enjoyable and involved a lot of participation. The teaching techniques used really helped me to improve in a short period of time. The location was excellent. The apartment itself was small but well equipped for its size. The course was very intensive but enjoyable. The teacher was excellent and very patient. The accommodation was very good and only a 20 minute bus ride from Termini station. The host family were vey friendly and welcoming. Dinner was typical Roman home cooking and delicious. I had a great time in Rome. The school is run very professionally. I attended the 50+ course and was very impressed by the way that we were treated. Almost every day of our stay was planned properly from a visit to Napoli to the walk around Vila Adriana. The instructors were very knowledgeable and patient. I wish I could have stayed longer and continued my studies. Maybe next year. The course was amazing! I thoroughly enjoyed the time spent in class, and my instructor, Giulia, made the entire experience. I want to commend her on teaching ability. She was wonderful - she kept us engaged and made the experience a positive one from start to finish. Giulia was the best part of my course. Overall, my experience was wonderful. If I have the opportunity to do this again, I will certainly book agian. I have done courses at several language schools, and this was the best school I have attended, both in terms of general organisation of the school and activities, and the classes themselves. I enjoyed the structure of the classes, such that every day we worked on listening, speaking and comprehension, with not too much written, but enough to ensure we were able to do so. I stayed with a host family, half-board. As soon as I arrived, I felt instantly welcomed, and throughout my stay they were friendly and very inclusive. I hope to stay in touch with them even now that I have returned home. I enjoyed the lessons and found the teachers enthusiastic and helpful. The emphasis was on interaction and communication and less on formal learning. I liked this approach because many aspects of grammar can be learned away from lessons. The school also provided activities in the evenings and at weekends which were enjoyable. Levelling was perfect, both teachers and content right on the money. Clean and convenient; landlady an absolute delight. Air conditioning in Rome in July would have been appreciated by this pampered American. I was so pleased with every aspect of the my experience with your program, I will recommend it to all my friends. The language course was excellent. The outings and lectures were both great fun and interesting. I met some very pleasant interesting friends with whome I hope to keep incontact. The best was that at last I started to think and speak Italian. Roberto was an excellent instructor, and pleasant to work with. I am not a strong language student, and he was very patient with me. Very nice family. Good bus connection to school. The lessons were exclusively in Italian which I enjoyed and used various different formats, which kept things interesting. it was a fantastic experience and i would recommend it to anyone. the experience of actually living in a city and learning the langauge, soaking up the culture and making new friends was just great. I really enjoyed the course and picked up so much very quickly. I think the fact there is so much emphasis on speaking Italian means you pick it up quicker and feel more confident. Our group became very close through doing so much speaking together and it was great to work with people who were all supportive and encouraging. My group came from all over the world so it was a great opportunity to finds out about other cultures of the world as well as the Italian culture. The service was great. I started in a higher level class because my conversation was quite good but as I lacked knowledge in the verbs etc area, the teacher suggested I be re-assigned to a lower level which turned out to be better for me. Lia was an extremely friendly lady, we had similar interests and I was extremely pleased with the accommodation. Thank you. Highly recommend your service. The will pass on your details to other friends I have met who want to do the same. The course was fantastic, I would thoroughly recommend it. The school staff were extremely helpful and friendly. In addition to fun, engaging and challenging classes, they organised many seminars, tours and trips outside of school hours, the majority of which were accompanied by the teachers. My accomodation was in a great location, very central. Very impressed with the philosophy and standard of teaching. Absolutely first rate and would recommend it to anyone. I'm a language teacher myself and thought they hit just the right note of pushing us but making us feel comfortable. The course was good, very communicative and of a high level. The accommodtion I had was fine for young students. The landlady was very friendly and helpful. However it was a little basic for an older student. I found the method of instruction of an extremely high quality. The lessons were exciting well constructed and useful. The teacher was dynamic and encouraging and the other students were friendly. I thoroughly enjoyed the course. The course was demanding and stretching but good for me and I have made huge strides in knowledge and confidence of italian. Everybody were really helpful and I found the quality of the teaching excellent. A really good week all together. I recently attended a short course in Italian at the language school in Rome. I found it very helpful, and my teacher was excellent and very patient. I came away with a lot more confidence as a result of the help and tuition I received. I would definitely attend again, if and when I get the chance. My course was good and interesting. The teacher, Gianna, was fantastic. I found the material difficult but thoroughly enjoyed the classroom experience. In particular I liked, even more, the added on Internship that I did. The school staff that helped me with finding the internship were fantastic! Alessandro Agostini and Ursula. My accomodation was in a convenient location. The people I lived with were unbelievably attentive and helpful when I needed it. They are great, talented, social people and really keep the place clean and running smoothly. This has been one of the best experiences of my life. I am gratful for the opportunity!!! THANK YOU! nteresting and fun. I liked the style of teaching and the informal approach to involvement. The teachers were patient and understanding, yet manged to maintain the momentum of progress throughout the week. The accommodation was in an ideal location and the landlady was very attentive and friendly. Good standard of faciliities, but some things in need of repair. The two week advanced italian course was both demanding and enjoyable. I was pleased to attend a higher level than last year. As before I liked the vary varied lessons and the opportunity to meet and participate in the course activities with people from different countries. The teacher was very helpful and patient. Very creative and innovator. Good experience to share the class with people from all over the world. It's difficult to accommodate everyone in a class when students are attending for different periods of time, however our teacher, Claudio, mastered this very well and created a great atmosphere which encouraged interaction and stretched people's capabilities without ever putting any pressure. I really enjoyed the atmosphere in the school and would readily return in the future. The host family very welcoming and attentive to needs without ever being intrusive, well-situated & a lovely atmosphere also. I would definitely recommend this accommodation to any future students. Overall, a really great experience. The international mix of students and emphasis on speaking Italian really helped everyone make an effeort to speak and improve their level of Italian. I would have no hesitation in recommending this school. The teaching, learning environment and lessons were all fantastic. Really excellent - I will recommend them to my friends. We learned a lot. I thought Marina Ota the instructor was wonderful, very professional and friendly too. Loved staying with a host family. A great experience. I would recommend it to others. I did a 2-day private course which I greatly enjoyed as well as the social programme offered on those days. I plan to do a 3-week course in January. I stayed at a local hotel -the Piemonte which was very good. The course was excellent - well balanced, interesting and catered to the level and needs of the students. I thoroughly enjoyed my experience and I have signed up for another course. A very well run school, staff were friendly and welcoming and the course was varied and relevant to the learners. The teacher was focused on the needs of the class and instilled confidence and enthusiasm in the students to speak the language. I loved everything about it! The way the teacher approached teaching us and the activities we did were so wonderful in helping us learn. I truly felt I learned so much in such a short time. I really enjoyed the mix of students on the course and the friendliness and enthusiasm of the teachers. My Italian has certainly improved to the point where I'm having to concentrate quite hard whilst writing this in English as I'm thinking in Italian! The accommodation would have benefitted from a washing machine and an oven that worked. That said it wasn't far from the school, there was a bus stop more or less on the doorstep and it was clean. It was never boring, very interesting, individual and very communication-orientated; could have been a bit more grammar, but that's just a feeling. I learnt a lot, thank you again, Antonella! Room was clean, neat and nice decorated. The owner was very helpful and friendly. The teacher, Antonella, did a very good job! She is an extraordinary teacher! Best regards and thanks to her. I'm lucky I got her as language teacher. Really helpful course, great teachers! Thank you for your service, British office was really reactive when I had some questions, and overall I plan to continue studying with Apple Languages in the future. I enjoyed the course very much. My teacher (Gianna) was an excellent teacher and I enjoyed meeting the other students, including in the nice school café. I also enjoyed having free afternoons and made good use of them to visit Rome My host Monica looked after me very well and provided good evening meals. High standard of teaching - lively and interesting. Staff at the school were very friendly and welcoming and encouraged students to make it their base while in Rome. There was a good programme of varied activities. The school is well-situated with a café, roof terrace and computer room. Excellent accomodation with a delightful Italian host. It was exactly what I'd asked for. This was a very good experience in every way. I wish I could've stayed longer and hope to do another course one day, perhaps in another part of Italy. My host was delightful and couldn't have been nicer. A lovely part of town - quite a privilege. Very professional, interesting, dynamic. Excellent programme for extra school activities (seminars, excursions, guided tours). The language course exceeded all my expectations. I was very unsure of my abilities in Italian, being totally self-taught, but was soon put at ease and placed in a class with an excellent and encouraging teacher. I feel I have made good progress thanks to the support of the school. The cultural activities on the 50+ course were outstanding, giving the opportunity to visit Rome and its surrounds with knowledgeable teachers from the school. The accommodation, like the course, exceeded my expectations. I received a warm and friendly welcome from my hosts who were very willing to help with my faltering Italian. I look forward to returning. One of the highlights of the course was the opportunity to make friends from all over the world - with our common language being Italian. It was a very nice school and we appreciated our stay very much. The course was very interesting, everything in Italianlanguage… a little bit difficult but good and I think that we have learnt very much. The language tuition was excellent. Classes were varied, focused and enjoyable. I wanted to speak as much as possible and this was a big part of the course. I thought the tutors were lively and well-prepared. The apartment was well-placed, only 20 minutes walk from the school. The proprietor was friendly and helpful. The course was great, I learnt a lot and I had a great time there. It was perfect for me. It was wonderful! I've learned a lot! I'm going back already. The course is wonderful and structured really well with lots of interaction with other students along with a balanced grammar input. My host family and the accommodation was wonderful. I was blessed with a brilliant teacher who pushed me to use the language and I learned more than I thought possible. My accommodation was well located, about halfway between the Colosseum and S. Giovanni in Laterano,with good bus and metro links. Comfortable room and very helpful landlady. The course was practical but also a lot of fun. We laughed a lot during the sessions (at our own incompetence). By the end of the week I had italian words buzzing round my head as I tried to sleep. I think thats a good sign. I attended primarily as a vacation and found it a great way to spend the week. I really enjoyed the course and wished that I could have had more than one week! Loved the course, the methodology, the teacher, the staff. Everything was fantastic and above my high expectations. I felt lucky to get the apartment that I did. It was air-conditioned, spacious, clean and had a huge beautiful terrace with plants. Loved it! Didnt want to leave. The teaching was excellent, the teacher really knew what he was doing and made the lessons stimulating and productive. We were a class of completely mixed nationalities and a very good vibe was created. By the end of the course, I was very happy with my progress and wished I could have continued for longer. The course was lots of fun. I loved having people from all over the world and we really bonded over the course of 6 weeks. The professors were very helpful, approachable and cared about their students. My accomodations were good because it was in a nice, quiet neighborhood. I enjoyed the 2 weeks with the Club 50+ group very much. All of the students were especially motivated to learn a new language, the group was "molto simpatico", and the extracurricular activities planned by the school were wonderful. I made many new friends and I will certainly look forward to other such courses in the future. My Roma experience was positive and I would not hesitate to return there and to the school. I would like to thank the teachers for their effort in making the Italian language experience such an interesting one. The teachers were friendly, hardworking and conscientious and obviously enjoyed teaching. The class activities were varied. I thoroughly enjoyed the course and feel that my Italian has greatly benefitted from the high standard of teaching. All the staff at the school, from the secretaries to the teachers, were friendly, helpful and did their best to resolve any problems or queries. I would certainly recommend it to my friends. Good for hearing and speaking Italian and I appreciated the teachers' insistence that only Italian was used. My accommodation was very good and conveniently placed for school and for seeing some of the sites of Rome. A very enjoyable experience in all! The course was well presented, with lots of variety in the activities. The teacher was great. My hosts were brilliant. They really looked after me, the conversation was plentiful and the home cooked Roman food excellent!